As another swimming season comes to an end in New Zealand, we wanted to take some time to reflect on the successes and highlights of the past year. 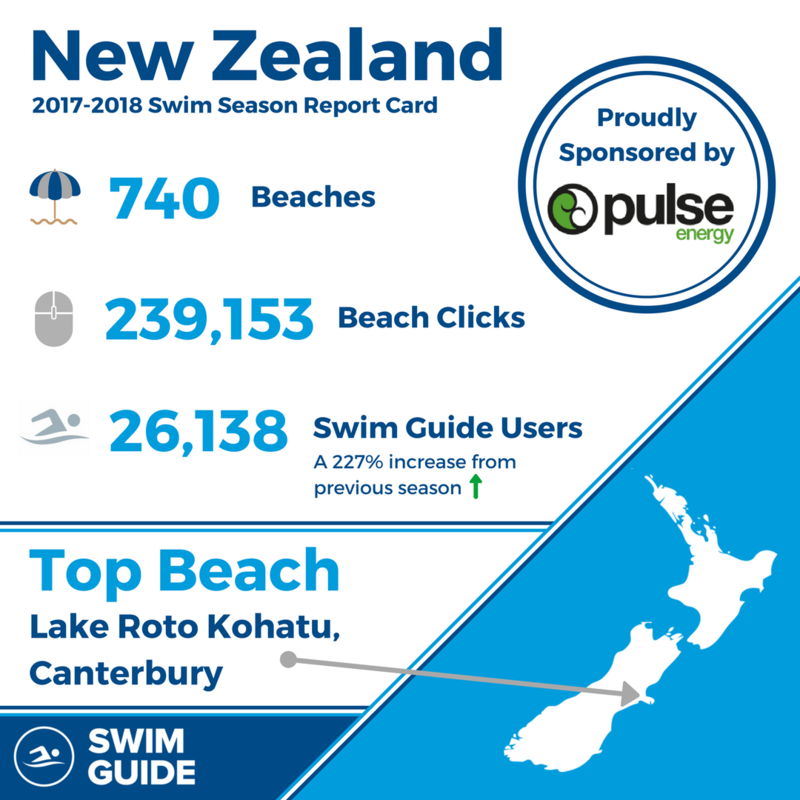 Having joined Swim Guide in 2014, Pulse Energy again sponsored and helped Swim Guide share water quality results for 716 beaches across all 16 of New Zealand’s regional councils. In New Zealand the beach monitoring season runs from October 1 to March 31, with the majority of sites being monitored either weekly or bi-weekly. This season 7,145 test results from New Zealand beaches were inputted into Swim Guide. Usership continued to grow in New Zealand this season as well, showing Kiwi’s both love their beautiful beaches and care about the quality of the water they are recreating in. In fact, the number of users grew from 8,232 in 2016-2017 to 25,119 in 2017-2018. That’s an increase of over 200%. In some regions, like Wellington, the growth in usership was over 300%! There was also a huge increase in sessions, meaning that those who use Swim Guide use it often. The number of sessions increased by nearly 20,000 from last season to this one, an increase of 203%. In total, New Zealand beaches generated 225,000 clicks! Here is a list of the Top 10 Beaches in New Zealand for the 2017-2018 season. This list truly represents the diversity and abundance of beautiful places to swim in New Zealand. The list features both newcomers and old favourites. 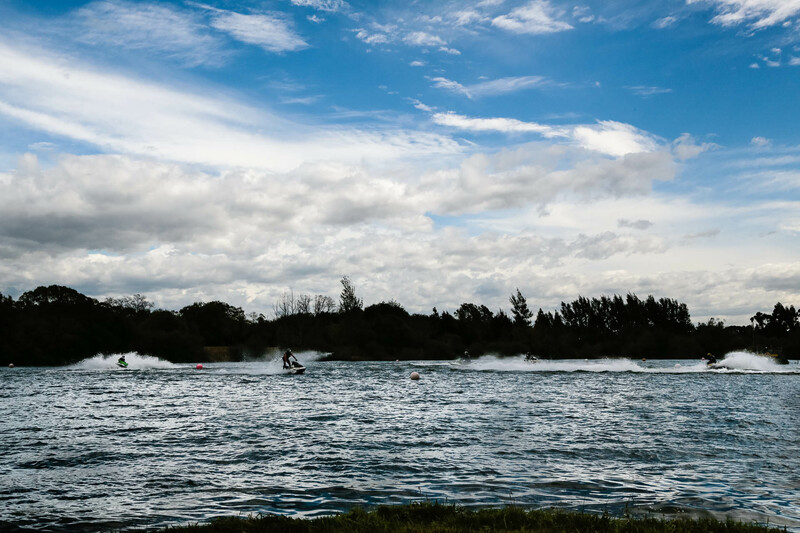 Lake Roto Kohatu, located just outside of Christchurch, took top place again, beloved for its accessibility from the city centre and the wide range of recreational water activities it offers. Akaroa Beach and Ashley River both made the top 10 for the first time. Just like last year, all of the Top 10 beaches are from either Auckland or Canterbury Regional Council. From oceanside surf beaches, to a hydro lake, to meandering rivers, keep this list in mind for planning next years beach days! This is a small lake just to the northwest of Christchurch city centre, and is part of the Sawyers Arms Reserve. There are boating facilities and a modest beach here; the neighbouring lumber yards give the area outside the reserve an industrial feel. The lake itself started off as a gravel pit, and has since been modified for park and recreational purposes. This is a popular swimming beach at high tide, but visitors warn that it can be quite muddy and slippery during low tide. The boat launch makes Point Chevalier very popular for water sports and boating. Cole Park is adjacent to the Point and has a child’s playground, picnic area and toilets. Ample parking and public transit stops are available at the end of Point Chevalier Road. Not far from Christchurch, at the base of the Mount Thomas woods, lies the Gorge Bridge crossing the Ashley River. The stretch of Ashley river underneath the bridge boasts clear waters and a number of deep, cool swimming holes, and the Ashley Gorge Holiday Park is within walking distance. The area is thick with hiking tracks that traverse spectacular scenery and waterfalls, and the nearby holiday park can provide pay camping and the usual amenities. Nestled behind high dunes of black sand, Lake Wainamu is a popular freshwater swimming mecca, and makes a great respite from the powerful wind and treacherous riptides of the nearby oceanfront at Te Henga/Bethell’s Beach. The picturesque Waitohi falls are located only a short hike away, but be advised that there isn’t much in the way of beachfront abutting the lake. There is no cost to visit Wainamu, and it is accessible by foot from Bethell’s Beach park area. Originally known to the Māori as the Waikirikiri River, the water levels of the Selwyn River change from an almost non existent gentle trickle to violent flood zone depending on the season and location. There are many swimming holes and picnic areas along the lower reaches of this river and this location offers visitors freedom camping in the summer. Kendall Bay beach provides a safe swimming environment during high tide and has a number of bush walks to entertain the family during low tide. 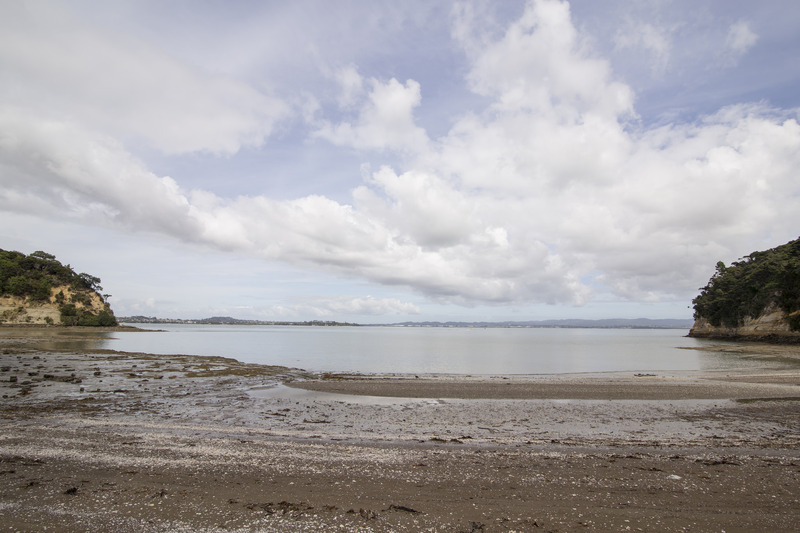 The beach is located in Kauri Point Centennial Park close to the entrance of the Waitemata Harbour. Amenities include benches and toilets. Beautiful white sand stretches along Clarks Beach suburb. This beach is located at the mouths of Waiuku River and the Taihiki River on the Manukua Harbour. Public toilets are located at 3 sites along Torkar Rd and 2 places on Stevenson Rd between Stella Drive and Clarks Beach Rd. There is a public boat launch is located at off of Torkar Rd. before the campground and yacht club. Akaroa is a region very proud of its French heritage, and also of the magnificent beach waiting to be discovered here. 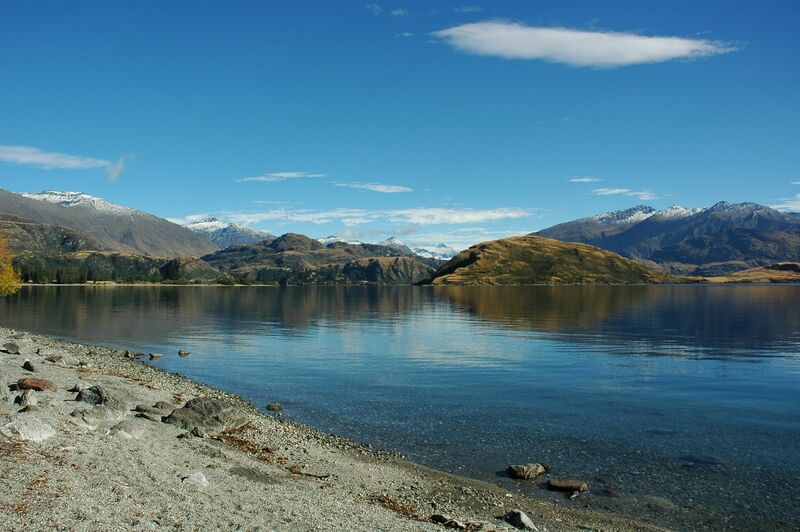 Akaroa beach is quiet, secluded, and sheltered, with a mixture of sand and small rocks abutting the water. Akaroa Harbour is also home to pods of rare Hector’s dolphins, which lucky swimmers may be able to spy further out from shore. The beach is adjacent to Jubilee Park, and there are two large car parks just above the sand line. Kaitarakihi Bay is a beach with fine, pale sand and makes a quieter and less-crowded alternative to the nearby Cornwallis beach. Gorgeous views of Manukau Harbour can be had from the beachfront, and welcome shade is provided by a copse of overhanging pohutukawa trees. On the road down to the beachfront, visitors can stop off to see Spragg Monument, a stone spire erected to honour a local pilot killed in the First World War. Facilities include parking and toilets. Titirangi translates to “long streak of cloud in the sky”. The park surrounding this sandy beach provides habitat for many of New Zealand’s birds including the Fantail, Tui, Kererū, white eye and moreportk. The beach is on the Paturoa Bay is part of the Manuka Harbour. Auckland Transit buses 173, 180, 181 and S025 stop at the tip of the park, providing easy access to this beautiful beach. Facilities include parking, children’s playground and sports field. The sand is filled with sharp oyster shells at low tide and shoes are recommended.